Common Types of Fractures Found in Children Research Papers study the differences in adult fractures and childhood fractures, and the treatment needed for childhood fractures. This is a topic suggestion on Common Types of Fractures Found in Children from Paper Masters. Use this topic or order a custom research paper, written exactly how you need it to be. Many types of childhood injuries involve broken or cracked bones. Childhood fractures differ from adult fractures in several ways including the time it takes for them to heal. There are many different types of fractures that are common in childhood. These fractures are obtained in a number of ways including car accidents, normal play, participation in sports and child abuse. A fracture is a break in a bone, either in the shaft or joint. A majority of fractures in children are due to injuries associated with minor falls and twists. Most childhood fractures can be treated relatively easy. However, some children fractures are more serious in nature and require the care of an expert in pediatric orthopaedics. 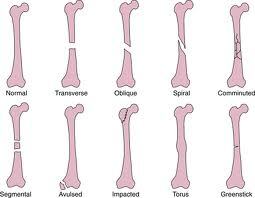 There is a significant difference between adult and childhood bones. The bones of children can withstand a greater bending force than that of an adult. Because of this added flexibility, a young bone can crack without actually breaking. Additionally, childhood fractures tend to heal much quicker than adult fractures. Fractures in children tend to fall into one of several types: closed fracture, open fracture, pathological fracture, comminuted fracture, greenstick fracture, and epiphyseal separation. In closed fractures there is no communication from the fracture to the surface of the skin. Open fractures pose a more serious problem in that there is a greater potential for complications. With open fractures, there is an opening from the fracture to the surface of the skin although the opening may not always be directly over the fracture. Open fractures may also involve tissue damage. Pathological fractures occur when the bone is weakened by a disease or bone cyst. This type of fracture requires little force and may occur while the child is playing. Comminuted fractures are characterized by a break with three or more fragments. Greenstick fractures occur when one side of the bone breaks while the other side bends. These types of fractures occur in children due to the plasticity of their bones. In many cases this type of fracture goes undiagnosed and untreated. They are often accompanied with mild pain. Type III, compression injuries of the epiphysis. Grade 2 is the most common of all epiphysial fractures in children. ADHD - An ADHD research paper points out that children who suffer with Attention Deficit Hyperactivity Disorder (ADHD) have difficulty concentrating for long periods of time, have short attention spans, and may have difficulty with schoolwork. Children with AIDS - These researchers questioned child care providers as to the level of stress that felt while caring for children who have been diagnosed with having HIV or human immunodeficiency virus. Children's Health Insurance - This program is a federally funded extension of Medicaid for children. Paper Masters writes custom research papers on Common Types of Fractures Found in Children and study the differences in adult fractures and childhood fractures, and the treatment needed for childhood fractures.